Porsche’s 911 is set for a major overhaul later this year ahead of the introduction of an all-new generation in 2018. 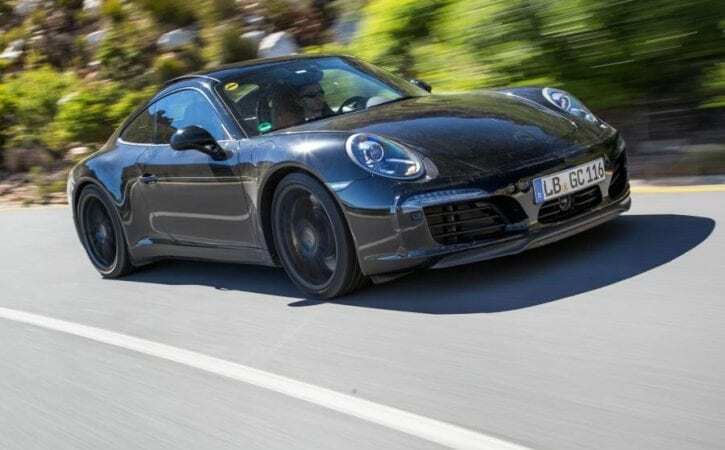 These pictures, supplied by Porsche, reveal prototypes of the refreshed 991-generation 911, which will feature a new turbocharged horizontally opposed six-cylinder engine when it goes on sale in the UK later this year, being put through its paces by a Porsche engineering team in Cape Town, South Africa. Technical details of the facelifted 911 remain scarce, although Autocar understands its new turbocharged engine will have a capacity of less than 3.0 litres and produce up to 365bhp in the new 911 Carrera. Also revealed in these official Porsche pictures is a new steering wheel-mounted driving mode control offering the choice between four programmes. Styling changes include a revised front bumper, larger air ducts for improved cooling of the three front-mounted radiators and slim LED daytime running lights. The basic headlight shape remains but the internal graphics are new. The door mirrors receive an LED blinker function, the tail lights get revised LED graphics and the rear bumper features cooling slits to help extract hot air from the engine bay. The new multimedia system recently seen on the facelifted Cayenne will also be fitted. The new horizontally opposed four-cylinder engines currently under development by Porsche will be seen first in the upcoming facelifted Boxster and Cayman. They are not planned for the 991-series 911, although they are being discussed for the successor model due in 2018.